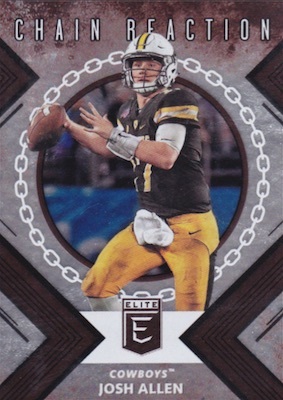 Again focusing on top gridiron players from their college days, 2018 Panini Elite Draft Picks Football is heavy on NCAA talent from various points in time. 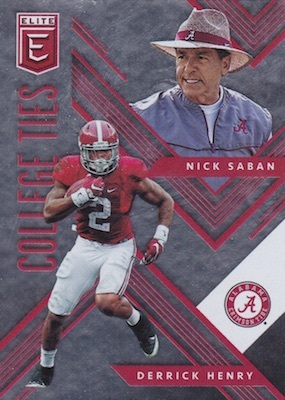 The set also offers the earliest chance to obtain official college card signatures for key incoming rookies ahead of the 2018 NFL Draft. 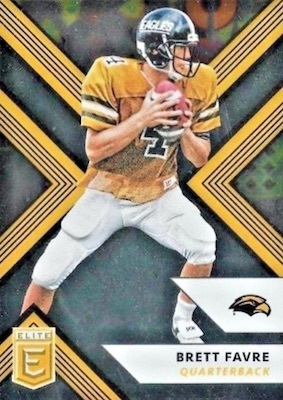 Year two for the collegiate brand, 2018 Elite Draft Picks Football averages five autographs per hobby box, with an expected rate of one signed card per pack. 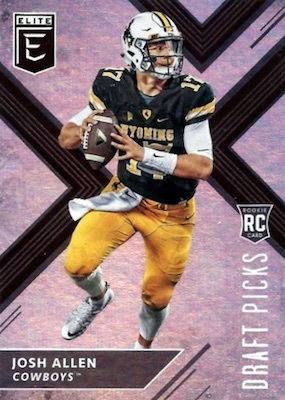 Maintaining the "X" design from the 2017 set, most of the box contents are from the base cards or Draft Picks subset. Colorful options include Blue, Emerald, Gold, Purple, Red and Teal editions in both Aspirations and Status die-cut parallels. There are also retail-only Orange versions. Inserts combine to fall one per pack, and one insert parallel comes in each box. 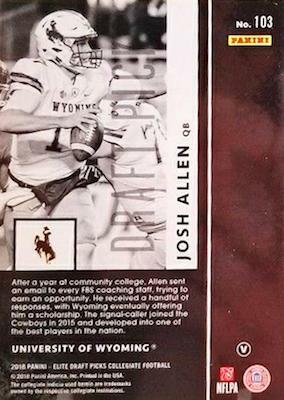 Among the choices are the popular Passing the Torch dual cards. 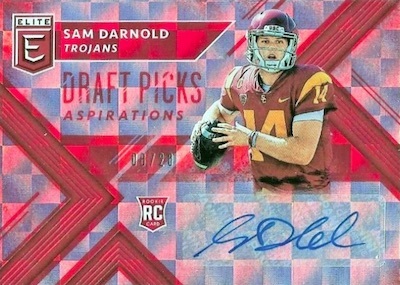 The 2018 Panini Elite Draft Picks Football checklist is also filled with signatures. Up first, Draft Picks autographs (and parallels) expand the main rookie set. 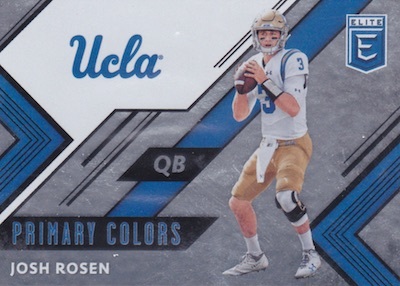 Exclusive to hobby, other signed options include Chain Reaction autographs, College Ties autographs, Elite Series autographs and Primary Colors autographs. Long a collecting institution, Passing the Torch autographs put a signature on each side of the card. These, too, are only found in hobby boxes. ASPIRATIONS PARALLELS: Orange, Purple #/99, Red #/49, Blue #/25, Gold #/10, Emerald #/5, Teal 1/1. STATUS DIE-CUT PARALLELS: Orange, Purple #/99, Red #/49, Blue #/25, Gold #/10, Emerald #/5, Teal 1/1. 54 cards, including 10 SPs. Short print cards average 15 total per case, or about 1 per box, overall. 152 cards. Shop on eBay. Confrimed SPs noted below. Short print cards limited to 50 copies or less. ASPIRATIONS PARALLELS: Purple #/99 or #/25, Red #/75 or #/20, Blue #/30 or #/15, Gold #/10, Emerald #/5, Orange #/5, Teal 1/1. STATUS DIE-CUT PARALLELS: Purple #/99 or #/49, Red #/49 or #/30, Blue #/25, Gold #/10, Orange #/10, Emerald #/5, Teal 1/1. 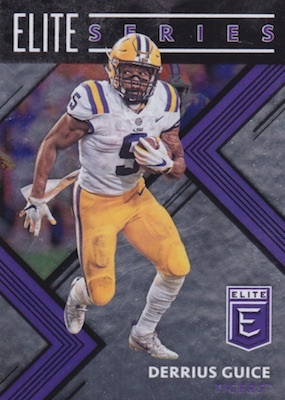 View the 2018 Panini Elite Draft Picks Football checklist spreadsheet. Totally agree, ridiculous the checklist isnt out yet! No Lamar Jackson autos. He should thank his mother for costing him $$$$. Hey Lamar, try a real agent. Months into the 2018 cycle I can safely say this is my favorite offering of the year. 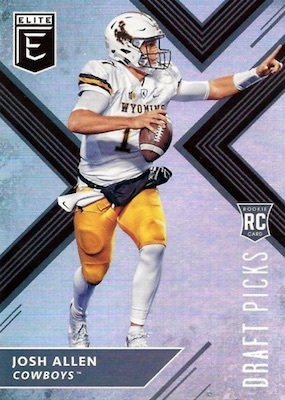 The cards looks great, and you get a ton of cool pulls in each hobby box.